Last year I posted my recipe for Classic Vanilla Buttercream. It’s the recipe I use for decorating cupcakes and birthday cakes, especially if I know kids will be the ones eating it. 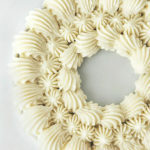 For wedding cakes I like to use a more silkier type frosting that I’ll share with you in the near future. But for everyday cake frosting, the vanilla buttercream is what I use. From that post, I received many comments and emails requesting a chocolate buttercream frosting which could also be used to frost cakes and for piping decorations. 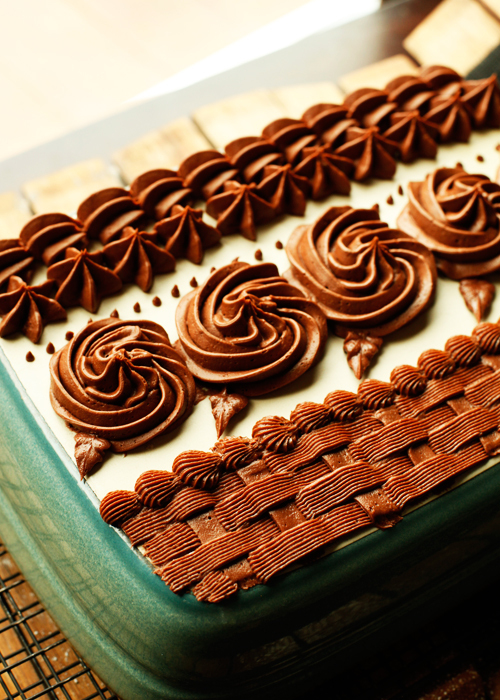 I often referred readers to my most favorite chocolate frosting I use for glazing, frosting, filling, and piping. 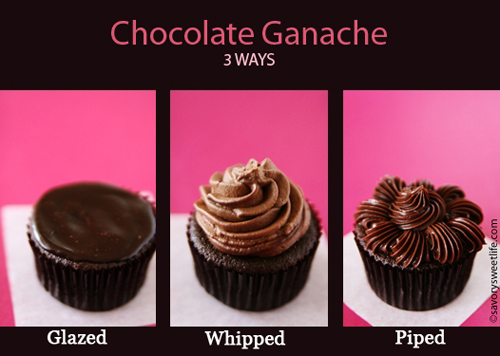 As you can see from the picture above, chocolate ganache is very versatile and best of all it is made with heavy cream and chocolate. But this frosting is also heavy and very decadent, unless you whip it. Some people would write me and tell me they didn’t want ganache but wanted a more true buttercream. So by popular request I made a batch of American chocolate buttercream over the weekend to share with you. 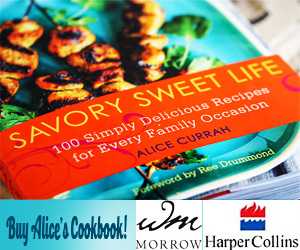 It is great for frosting cupcakes and cakes. It can also be used for frosting brownies or cookies. Like its name suggests, it is more buttery, creamy, and slightly sweeter than ganache. 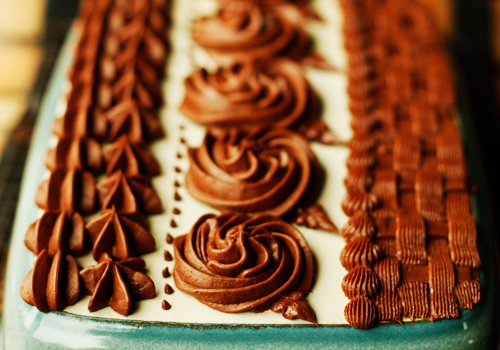 And like ganache, it pipes decorative borders very nicely. You will need to make sure your butter is soft enough to cream. Do not be tempted to softened it in the microwave unless you know how NOT to melt the butter. Melted butter will not work for this frosting. But if you do use your microwave, I like to place cold sticks in the microwave for 8 seconds. If it’s still too firm, I will microwave it for 2 more seconds. 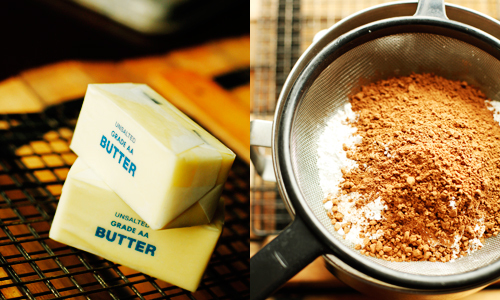 Next, you’ll want to cream the butter and then then add sifted sugar and cocoa. This is my daughter Mimi. She likes to help me in the kitchen whenever chocolate is involved. I’ve taught both of my daughters about the baker’s reward philosophy. If you help me in the kitchen, you also get to lick the spoons. Oddly enough, they never seem to want to help me when I’m cooking vegetables. Those stinkers. 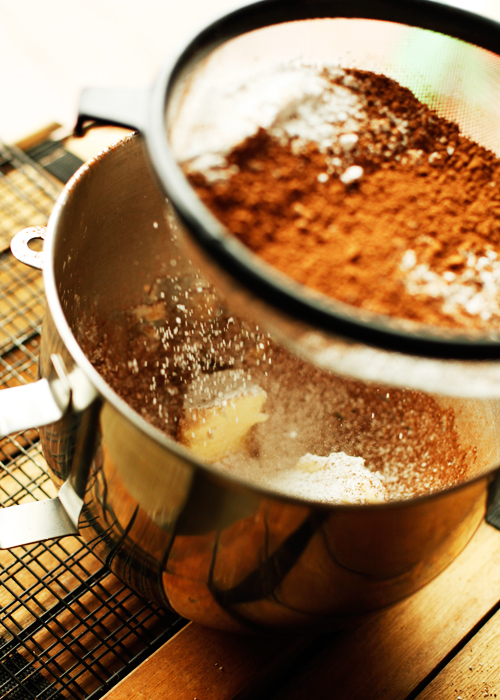 Be sure to start your mixer on slow speed after adding the dry ingredients. Otherwise you will have cocoa and sugar fly everywhere landing on everything within a couple feet of you. Your frosting will look strange like clumps of clay. Don’t worry. 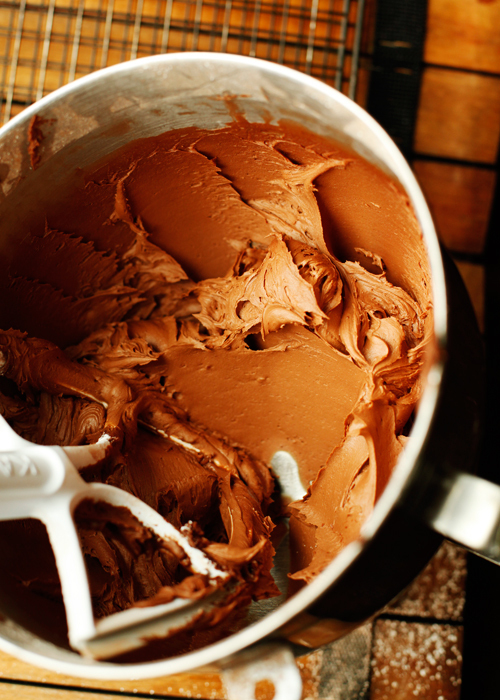 Once we add some cream it will transform into beautiful chocolate buttercream. When deciding on whether or not to use milk or cream, I prefer cream. It just makes the frosting… well.. more creamier. Half and half works too. But if you do use milk, it is better to use whole milk for the added fat content. I also prefer to use almond extract when making frosting. It enhances the flavor so nicely and a little bit goes a long way. But if you only have vanilla, use it! As you can see by these photos, this frosting pipes really nicely. The frosting can be refrigerated to use later. Just make sure it’s in a lidded container. Allow the frosting to warm up to room temperature on the counter before using. 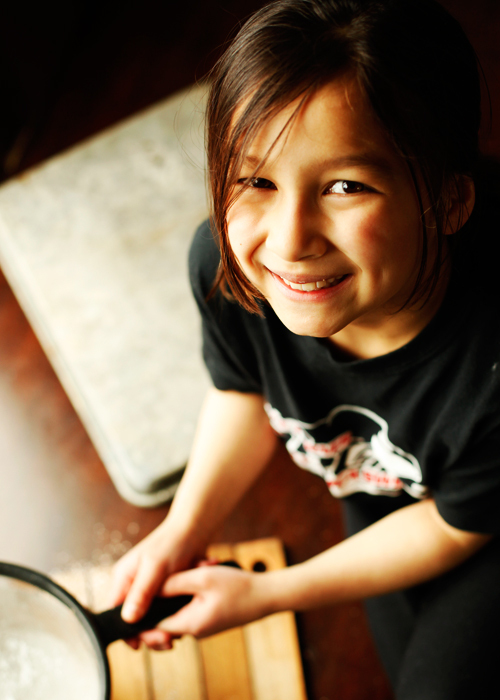 Happy cake decorating! Here’s a great short video tutorial I did for PBS on how to pipe these beautiful frosting flowers using vanilla buttercream on cupcakes, but you could easily do this with the chocolate one from this page. If you enjoy the video, please like it so I’ll be able to do more! And here’s another short PBS video tutorial I did on how to make Cookie Monster Cupcakes. Hi, could you link thr gaunache frosting recipe? Unfortunately there were a lot of stolen pins of mine there so Pinterest removed all of them, including mine. Feel free to Pin again. And thank you for stopping by! I had pinned this recipe on pinterest a long time ago, and pinterest just notified me that they had to delete it based on copyright claims. Just an fyi in case it wasn’t your doing. You have a pin button on this page so I’m not sure why you wouldn’t want it there. p.s. It’s a perfect frosting recipe, even though I make it with Earth Balance and soymilk. I love the Baker’s Reward Philosophy! I’ll be stealing that for my own kids (if you don’t mind). Looks so delicious, too! If you double the recipe, what I would do is start with around 4 cups of sugar and then add according to your needs, keeping in mind the texture and stiffness you’re going for. This question may have been answered already, but how long does the butter cream frosting last in the refrigerator? This is the first time that I have tried this buttercream icing. My husband generally does not like frosting but he thought that this was delicious. This recipe will now be my go to chocolate buttercream recipe. Hi. 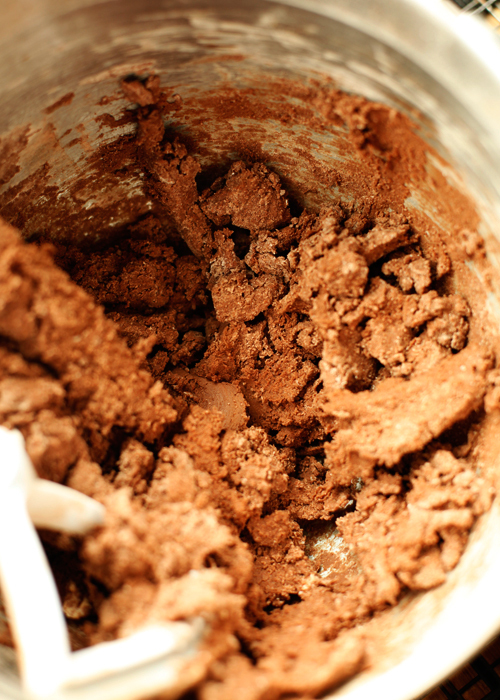 I would recommend using unsweetened cocoa powder because the recipe already has enough sugar. Hi! 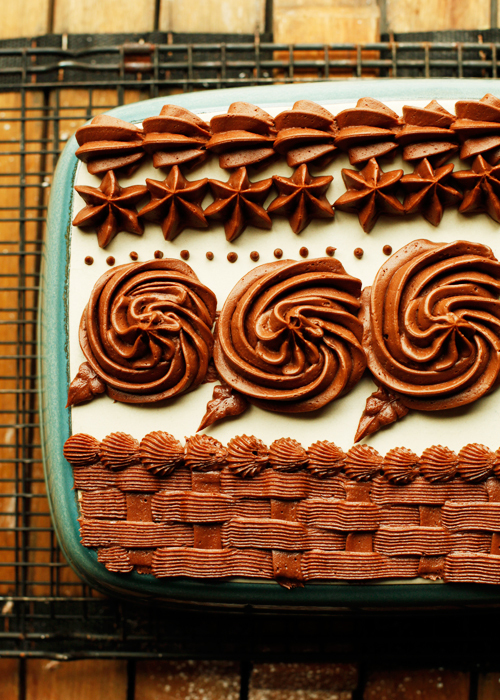 Should I use sweetened or unsweeted cocoa powder for the frosting? Glad you liked it! I made it myself this weekend. Can’t wait to try this recipe. The Classic Vanilla Buttercream Frosting was amazing!! Thank you for sharing. I love this chocolate buttercream recipe! It’s going to be my go-to recipe from now on. I was wondering, though, if you have a yellow cake/cupcake recipe to pair with it. I’ve tried finding a recipe from scratch that has the same flavor/texture of the boxed cake version, but to no avail. Any hopes on developing a yellow cake recipe? It’s my kid’s favorite flavor! And thanks for this buttercream! WOW! I can’t believe how good this buttercream is! It’s fantastic! The ingredients listed 3 1/2 cups for powdered sugar and 1/2 cup of cocoa powder… together it’s 4 cups… However in the instructions section, you said to “sift 3 cups”. How so?